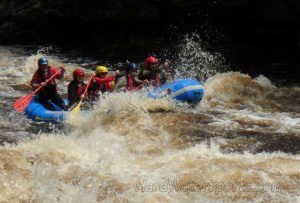 Whitewater Rafting on Minnesota's "clean and beautiful" Kettle River. For whitewater rafting adventures near Minneapolis, Minnesota your best choice is the “clean and beautiful” Kettle River. Just an hour north of the Twin Cities metro, a white water rafting tour on the Kettle River is the perfect adventure for you and your group. Tons of experience, amazing scenery, and super fun guides make us the perfect choice for your next Minnesota whitewater rafting adventure. Put some adventure in your life and allow us to guide your next Minnesota white water rafting trip. Whitewater rafting tours on the Kettle River run from the beginning of April to the end of October, you’ll always get an unforgettable experience when you take a Kettle River rafting adventure. Book early to lock in your date with adventure. Kettle River whitewater paddling adventures run 3 to 3.5 hours. Under “normal conditions” all Kettle River rafting and kayaking adventures meet at 511 Main Street, Sandstone MN. Due to unsafe water conditions or adverse weather the owners of Hard Water Sports reserve the right to cancel or alter the planned paddling trips. In the chance that river conditions are unsafe on the Kettle River, paddling trips may be moved to the St Louis River. All rafting participants must be 10 years of age or older, please read the essential eligibility requirements for Kettle River rafting tours.